I don’t know about you but washing clothes is one chore that I don’t really look forward to – it always creates so much mess and the process is so long! However, what if there was a product that could make washing a delight? If, like me, you are swayed by scents then this may be a product for you. 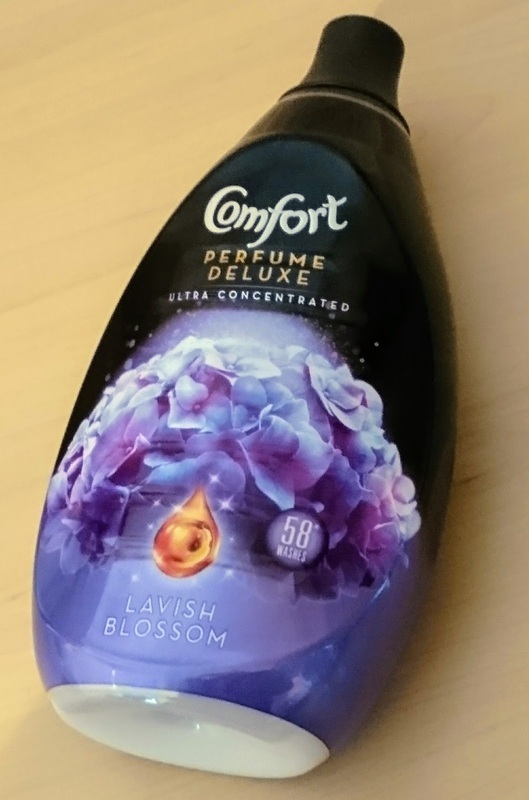 Comfort have recently released a range of ultra-concentrated fabric conditioners under its ‘Perfume Deluxe’ brand. According to comfort, the scents in this range have been crafted by perfume experts. 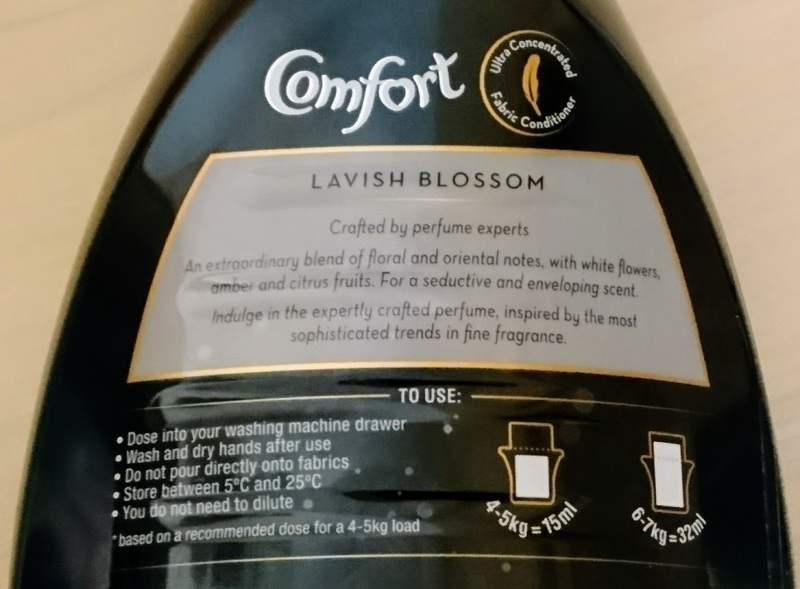 This week I have used Comfort’s new ‘Lavish Blossom’ scent which includes ‘an extraordinary blend of floral and oriental notes, with white flowers, amber and citrus fruits for a seductive and enveloping scent’. I really like the smell of this product – it is subtle, not overpowering and almost reminds me of the scents you would encounter in a spa. Comfort aim to encourage their consumers to ‘indulge in the expertly crafted perfume, inspired by the most sophisticated trends in fine fragrance’. The packaging is very pretty and looks like a luxurious brand with a dark background which makes the hydrangea flowers, sparkles and drop of perfume on the front of the bottle stand out. 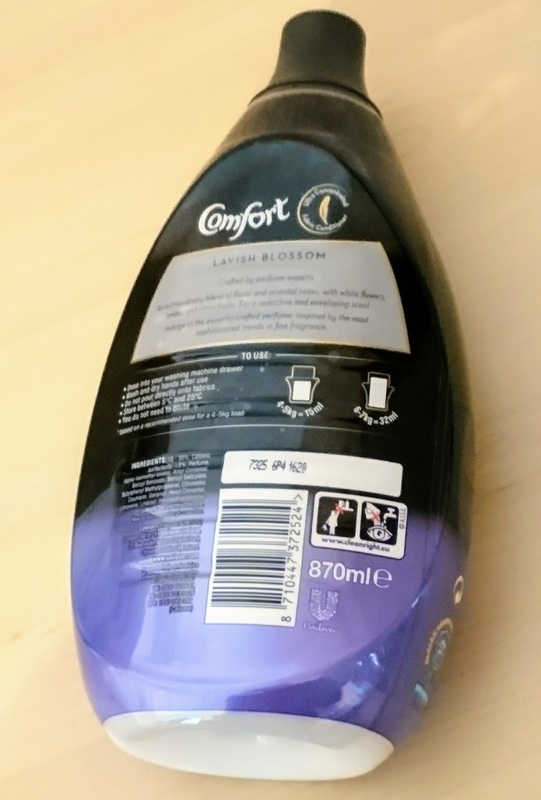 I used the fabric conditioner in my weekly wash. One 870ml bottle can do 58 washes and, as it is ultra-concentrated, a little goes a long way! Comfort recommend that you add the product to your washing machine drawer rather than in the drum and suggest that one 15ml dose will suffice for a 4-5kg load whereas a 32ml dose is better suited to a 6-7kg load. I found that the lovely scent filled the kitchen during the wash as the water heated up and also remained after the load had been tumble dried which is always a bonus. So, look out for Comfort’s Perfume Deluxe range in a supermarket near you! One hack I love to use around the home, particularly at this time of year, is simple and really effective. Simply dip a cotton wool ball into your fabric conditioner and lightly wipe the scent over your radiators. Then, when your heating comes on, your home will be filled with a wonderful scent throw. Similarly, you can use essential oils to the same effect. Alternatively, leave a cotton wool pad, soaked in your favourite home scent, tucked in to the top of your radiator out of sight to fill your home with a stunning smell. This thrifty trick can help you to use what you already have at home in place of purchasing expensive plug in scents! Which washing products do you use? Do you use fabric conditioner when doing your weekly wash? What washing hacks do you have up your sleeve? Comment below, say hello and let me know! Thank you for reading. To stay up to date with the latest tips, hints, bargains and finds as you meander your way through parenthood like me be sure to click subscribe and comment. You can follow us on Facebook, Instagram and Twitter too! Disclaimer: Our reviews are always reflective of our own opinions. Therefore, you can rest assured that my Mummy opinions have not been influenced by any of the brands mentioned.